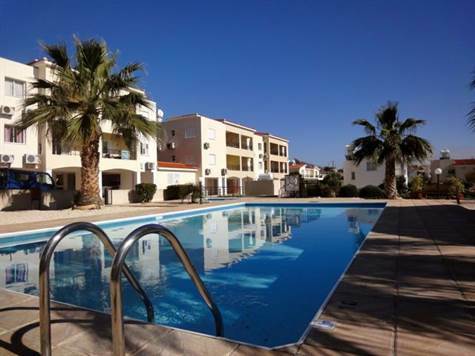 Peyia, Paphos - This impressive top floor 3 bedroom apartment is located a few minute’s drive from the centre of Peyia village, and the popular holiday resort and sandy beaches of Coral Bay. The property features a huge, light and airy living space, with patio doors opening on to a good size covered veranda. The sea views are spectacular from here, and there is also a nice view of the immaculately kept communal pool area and landscaped gardens. An archway from the dining area leads through to a large kitchen with access to a rear balcony with lovely mountain views. The kitchen is well equipped with cooker, fridge/freezer, microwave and washing machine, and there is plenty of cupboard space including a useful tall broom cupboard. There is a hallway off the living room leading to 3 double size bedrooms, and a family bathroom. The master bedroom has an en-suite shower room, and patio doors opening on to the front veranda. The second bedroom has access to the rear balcony. All the bedrooms have fitted wardrobes, and both the en-suite shower room, and family bathroom, have a fitted vanity unit providing further storage space. There is an additional room located next to the allocated car parking space which, due to it’s large size, is suitable for use as an office/study, fourth guest room or storage room. The property is in very good condition, and has a lot of extras such as fly screens, air conditioning, shutters, etc, and the furniture is also included. The project is very well maintained, with a good size swimming pool and terrace surrounding, a children’s pool, and purpose built showers and toilets. The property is ideal for both residential living, or as a holiday residence.